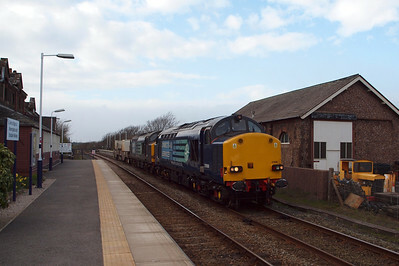 April 2, 2012 - 20303 & 37409, 6K73, Ravenglass. 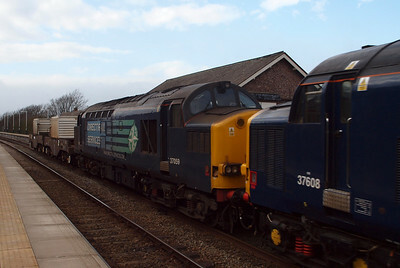 April 3, 2012 - 37608 & 37059, 6K73, Ravenglass. April 4, 2012 - 57007 & 57009, 6K73, Seascale. 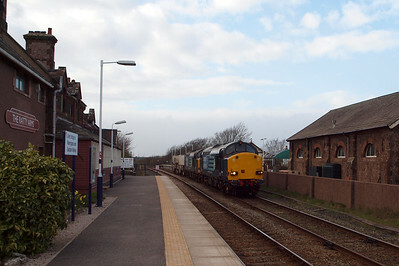 57011, 57002 & 37611, 6C46, Nethertown & St Bees. 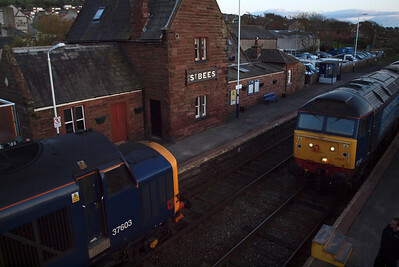 37603 & 37606, 6M22, St Bees. 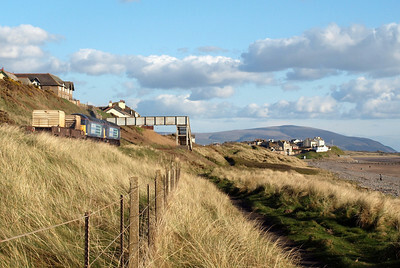 April 5, 2012 - 57011 & 57002, 6M60, St Bees. 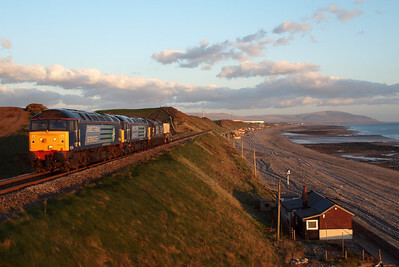 April 10, 2012 - 37603 & 37606, 6K73, Seascale. And then no further photos for six weeks as I broke my ankle while walking back to the car, just after I got the shots of 6K73 on April 10th! 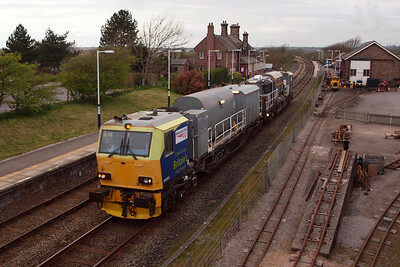 A weedkilling MPV heads south through Ravenglass, 02/04/12. 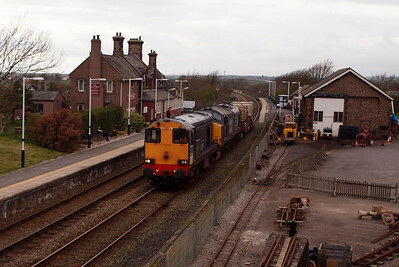 20303 and 37409 pass through Ravenglass with 6K73 to Crewe, 02/04/12. 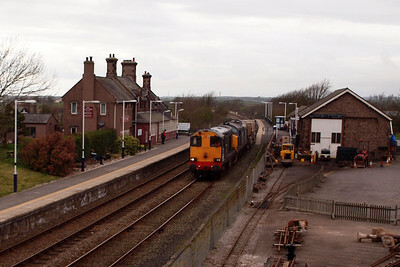 20303 & 37409 Lord Hinton at Ravenglass, 02/04/12. 20303 leads 37409 Lord Hinton south through Ravenglass with 6K73 Sellafield - Crewe, 02/04/12. 20303 & 37409 pass the withdrawn Maxi coaches on the Barrow headshunt at Ravenglass, 02/04/12. 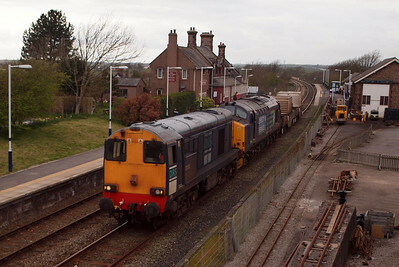 37608 & 37059 work a delayed 6K73 through Ravenglass, 03/04/12. 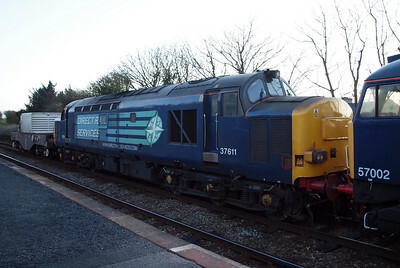 37608, recently repainted, leads 37059 through Ravenglass on 6K73 to Crewe Coal Sidings, 03/04/12. 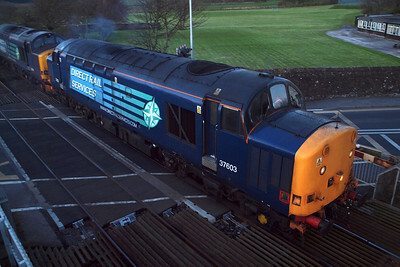 37059, which was withdrawn shortly afterwards and put into store, as the train loco on 6K73, 03/04/12. 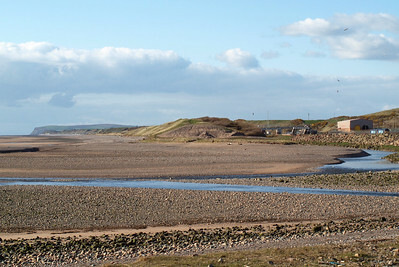 The beach at Sellafield, showing the confluence of the rivers Ehen and Calder, 04/04/12. 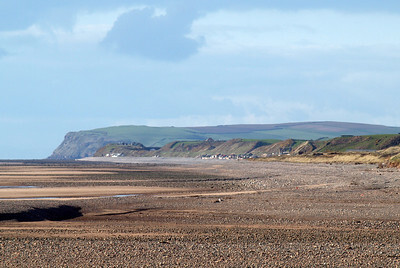 St Bees Head and the Cumbrian coastline from Sellafield, through Braystones and Nethertown, to St Bees, 04/04/12. 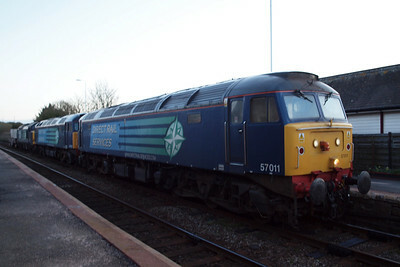 57011 & 57002 sit in the up sidings at Sellafield, 04/04/12. 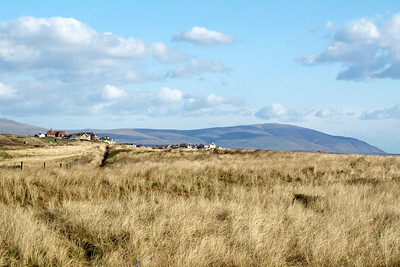 Black Combe and Seascale, 04/04/12. 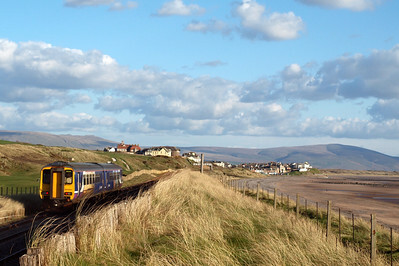 156484 heads south past Seascale golf course, 04/04/12. 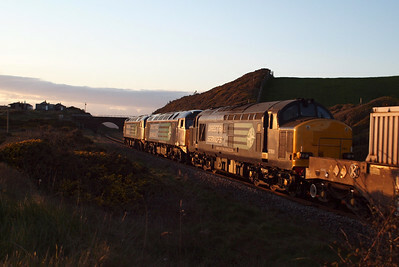 57007 & 57009 get underway from Sellafield with 6K73, passing Seascale, 04/04/12. 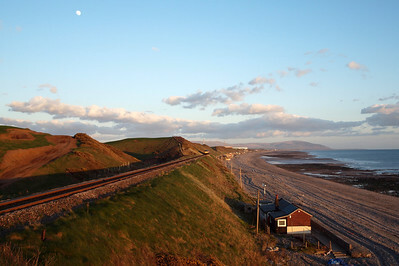 A lovely evening on the Cumbrian coast at Nethertown, as 6C46 approaches, 04/04/12. 6C46 approaches Nethertown, with three locos at the helm this evening, 04/04/12. 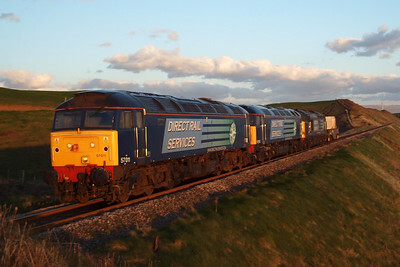 57011 & 57002 lead a DIT 37611 past Nethertown in evening light on 6C46 Sellafield - Carlisle Kingmoor flasks, 04/04/12. 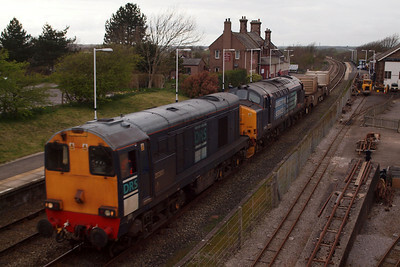 57011, 57002 and 37611 triple-header on 6C46 at Nethertown, 04/04/12. 6C46 on the curve at Nethertown, as the evening sunlight glints off the bodysides of the locomotives, 04/04/12. 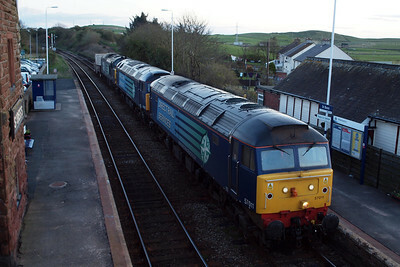 57011, 57002 & 37611 sit in the down platform at St Bees on 6C46, 04/04/12. 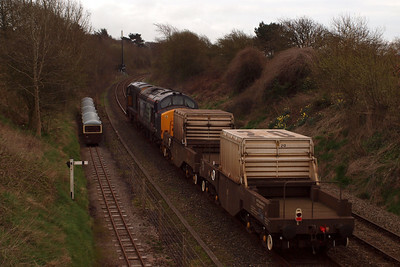 6M22 approaches St Bees, with 37603 at the helm - flasks from Hunterston to Sellafield, 04/04/12. 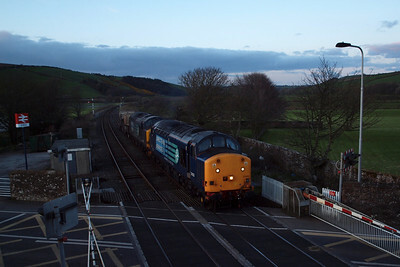 37603 and 37606 roll over the level crossing at St Bees with 6M22 Hunterston - Sellafield, 04/04/12. 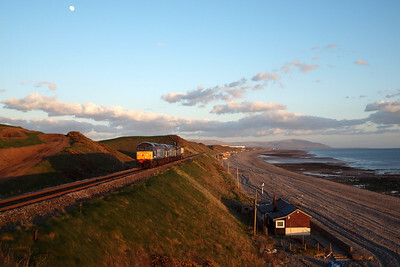 37603 arrives at St Bees, 04/04/12. 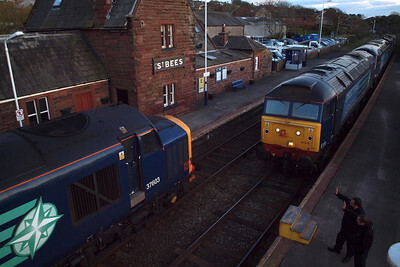 37603 meets 57011 at St Bees, 04/04/12. 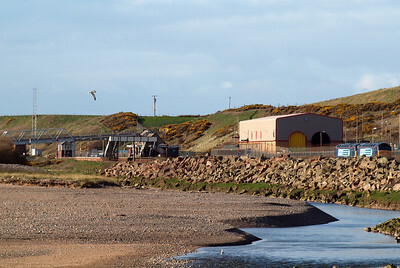 The traincrew of 6C46 (Carlisle men) wave to the crew onboard 6M22 (Sellafield men) at St Bees during the token exchange, 04/04/12. 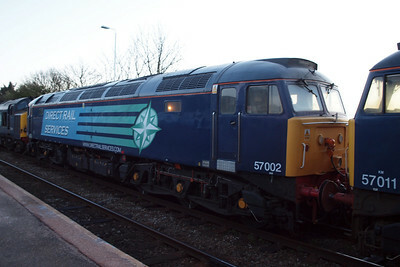 6C46, with 57011 on the front, waits for the road at St Bees, 04/04/12. 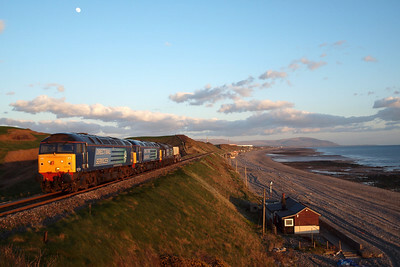 57002, in the consist of 6C46 at St Bees, 04/04/12. 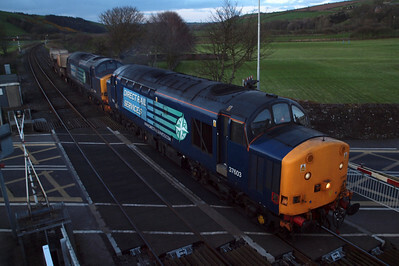 37611, being towed from Sellafield to Carlisle by the 57s, 04/04/12.